I like it when exhibition curators draw parallels between different art forms or, perhaps more accurately in this case, use evidence from one art form (in this case literature) to comment or elucidate another (here, figurative art). Exhibition curator Penelope Grist describes* the exhibition as being about “humanness – the experience of a mind enfleshed in a body”. She goes on to say that “relationships between the human mind, flesh and lifespan underpin the nature of portraiture”. But wait … are these portraits? Technically not, I think, not if we understand “portrait” to mean the depiction of a specific person. While individuals may have modelled for works in this exhibition, they are not, with an exception or two, identified. Given the subject matter of the works, I don’t see this as a problem. Categories are sometimes best left fluid. This exhibition looks at the idea of “humanness” through ten themes – Intimacy, Empathy, Transience, Transition, Vulnerability, Alienation, Restlessness, Reflection, Mortality and Acceptance – which are, in themselves, interesting. I can imagine the fun the curators had in deciding these ten themes. They are an eclectic bunch, but they make sense. The works exhibited vary in form and come from ten contemporary figurative artists: Natasha Bieniek, Robin Eley, Yanni Floros, Juan Ford, Petrina Hicks, Sam Jinks, Ron Mueck, Jan Nelson, Michael Peck and Patricia Piccinini. I like art but keep up with it erratically, so was really only familiar with two of these: Ron Mueck and Patricia Piccinini. The contemporary art of In the Flesh takes the weight of the thousands of years that human minds have expressed in art their struggle to comprehend the existence, transformation and demise of the human body. The ten quotations from Shakespeare to The Doors that accompany each theme reference this legacy. I’m not sure why she limits her comment here to “the human body”, unless she doesn’t mean it literally, because the quotations themselves refer more widely to the condition of being human. And the rest of her article encompasses a broader concept of “humanness”. I’m not going to discuss the ten themes in detail, and I’m not going to include a lot of images**. Instead, I’m going to briefly discuss my responses to two of the works to exemplify how one can enjoy this exhibition. 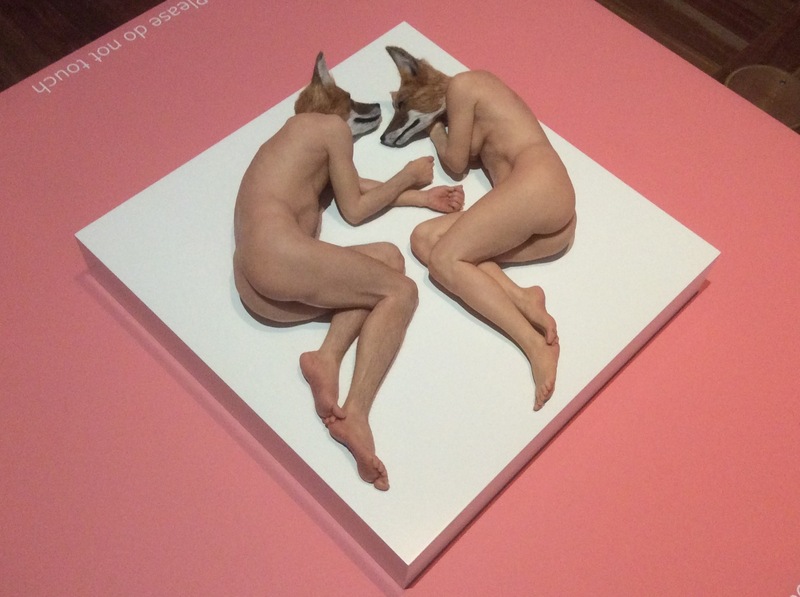 The first room is devoted to Intimacy, and it contains works by sculptor Sam Jinks, one being “Unsettled Dogs”. I was captivated by this. It’s tender, fragile. They look paradoxically trusting and vulnerable (another of the themes) as well as intimate. But it’s also disconcerting, because of the dog-heads. Grist explains this: “the dog-headed cynocephalus of ancient and medieval imagination reminding of the human capacity for destructive irrationality within intimate relationships”. I have always seen dogs as benign not destructive creatures, but the sculpture does indeed capture the tension contained in this classical concept. Perhaps it’s also because the dog heads are fox-like which we Aussies definitely equate with destruction. Standing strong, grasping staff-like branches as if to communicate his allegiance to nature’s side of the war. Bound in industrial detritus, this figure wears a tribal outfit that might be conjured from a Mad Max film, like a lone-warrior of both painting and the wild – and a caricature of himself as the artist. 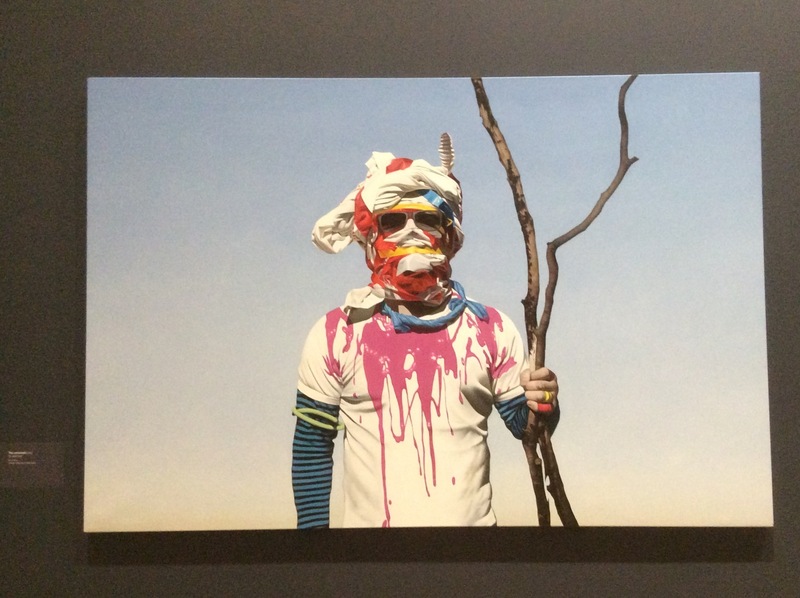 The title itself suggests a challenge to the colonialist tendencies of the painting traditions he seeks to subvert, redirecting their Orientalist imperatives into the wilderness; an exorcism performed by an Absurdist shaman. I can see the tension between children, play and weapons, and I appreciate Ford’s wanting to subvert colonialist traditions. However, in the current environment of concern about the radicalisation of young Australian men, this work had another layer for me. Am I over-thinking it? It certainly made me ponder how art can take on different meanings according to circumstance. The ultimate description of our “humanness”! 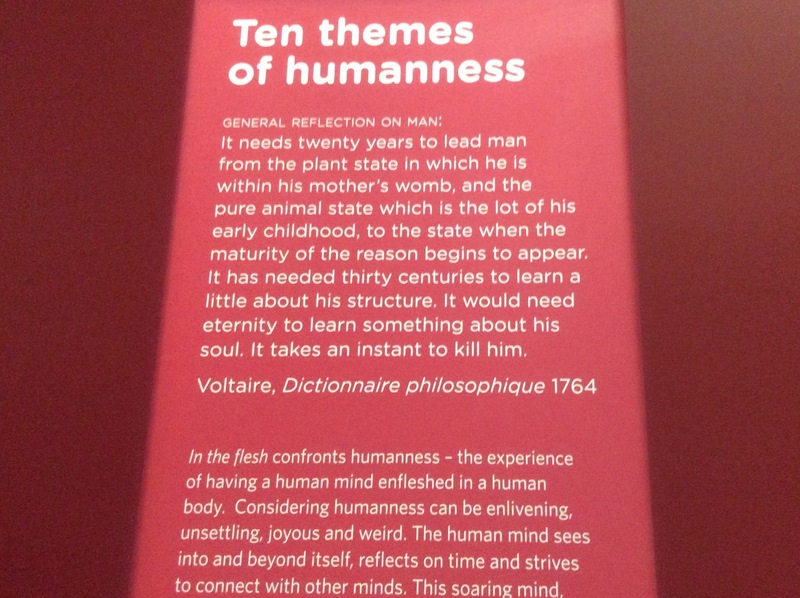 * “In the Flesh: an exhibition of humanness in ten themes” in NPG’s magazine Portrait #47 (Spring/Summer 2014). Currently for sale but will, I believe, be available online on the magazine’s site down the track. The article includes excellent images from the exhibition. ** I’m not totally sure of copyright issues, and I don’t want to detract from the exhibition itself, so I’ve just included a couple of my poor quality iPad images of works that the NPG has used on its website. You can click on the images to see them bigger, though not necessarily better! I am assuming that my use here is covered by fair dealing for criticism or review. Really is Belinda … Thanks for reading and commenting. Hi Sue, What a great idea for an exhibition, a combination of artistic styles. I saw Sam Jinks’ art at Shepparton Arts Museum, several years ago, and found them fascinating. Thanks for the photos. Thanks Meg … Would love to have used more … A lot of variety in the exhibition even if most in hyper-real style. Apparently, biggest proportion of artists are from Melbourne. Love Victoria’s regional galleries. I did make some comment about this at the end of the article. I also think that this use would be covered under fair use for criticism or review … And I will add that to my point. What a really interesting exhibit! Love how it connects to other arts too with the quotes. I don’t think you are having an odd reaction to the Reorinalist at all. On first glancing at the image before reading what you said about it my first impression was of a jihadi fighter or something. It’s likely the artist is aware of the resemblance too and is maybe hoping to create a disturbed feeling in the viewer in addition to all the other things? I should dearly like to visit this exhibition, were it not in an environment that means day-tripping is impossible. Thanks very much, Sue ! Thanks MR … You can do it in a day, by coach, but it would be tiring. And would probably require a couple of taxis to and from the coach to the gallery. There are buses but it would all be fiddly. So, yes, I understand it would be out for you. A shame. I think it’s just that our smaller size, MR, means thee things are easier to get too and are not lost amongst things going on all over a huge city. But it does show those naysayers that Canberra is not a boring place! Well,not for those to whom things cultural appeal, anyway.